In a down to the wire finish, Danny Brown and George Apted have snatched victory at the ARB Albins Goondiwindi 400 from Dad Andy Brown and Ross McNabb. Heading into the final lap of the day Danny led on the track but Andy had a 15second buffer on outright combined time. At the drop of the checkered flag, Danny had made up the 15second deficit and pulled a 27 second lead in the debut run of his recently landed Alumi Craft to take the win. Andy’s final lap was nearly a minute slower than previous laps with the oil light coming on in the #45 Saber everytime they went into a corner and they had to wait for it to go out before they could push on hard again. 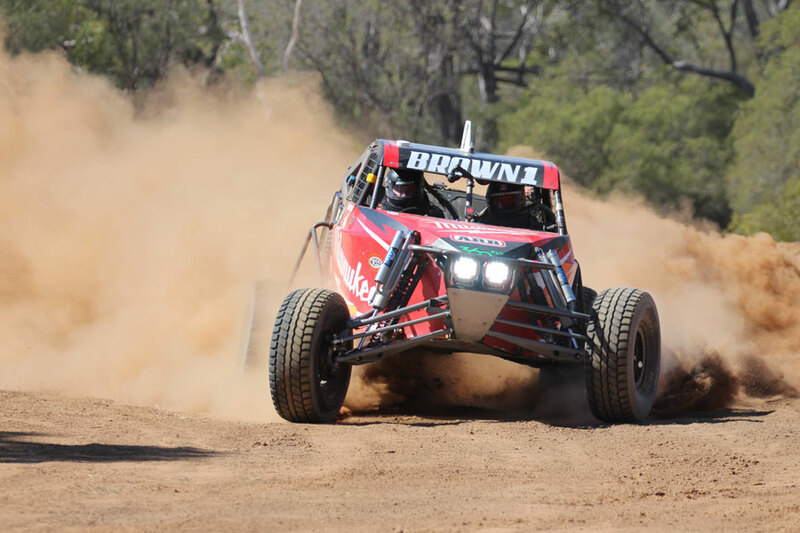 The win rakes up three Goondiwindi titles for the reigning ARB Australian Off Road Racing Champion, however, with this weekend round the first for Danny this year, he will be handing the perpetual trophy over come Championship end. The hot contender to take out the 2018 Championship crown and rounding out the Albins ARB Goondiwindi podium is another second generation racer Brent Martin and Jimmy Boyle; the #120 JImco 2m7seconds off the pace of Andy Brown. Jeff McNiven and Andrew Reid were 22m54seconds off the pace to slot the #603 Can-Am into fourth place. Talbot Cox and Andrew North started out of pole position for this morning section however stopped trackside to fix a bypass shock bolt on the first lap and then pitted at the end of the lap to affix further repairs. They stormed through the field for this afternoons section to finish the entire event in fifth outright.